Today I hit my first stampin' frustration! 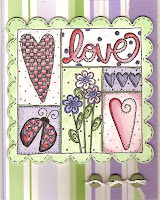 I used a borrowed stamp to make this Love Quilt Card and while it was pretty, it was not easy. There was a lot of small detail. Take a look and you'll see what I mean! Even though there is a lot of detail I bet you were more than happy with the result. Not one you would do every day of the week but gee it is pretty. What a great card Donna! The colouring is great!